A stiff wind blows, and I have to shift from V2 to V1 as I climb the hill. Fortunately, it's not the middle of the winter and I'm not risking frostbite. The wind is actually cooling on this hot summer day as I take a pair of new Pursuit Fork Flex Rollerskis for an 8.5 mile ski around Kensington Metropark near Milford, Michigan. The bike path offers a mix of flats and hills, plenty of transitions, and a fast downhill corner. Perfect for testing rollerskis. The Pursuit Fork Flex joins a growing number of rollerskis that feature some sort of suspension mechanism (e.g., the Pro-Ski (now Swix) C2 Flex and the Rundle Sport RS-10). Whereas the C2 Flex uses a tensioning rod and the RS-10 a set of dampers to provide suspension capabilities, the Pursuit Fork Flex uses a low frame coupled with a spring-steel fork to provide flex. 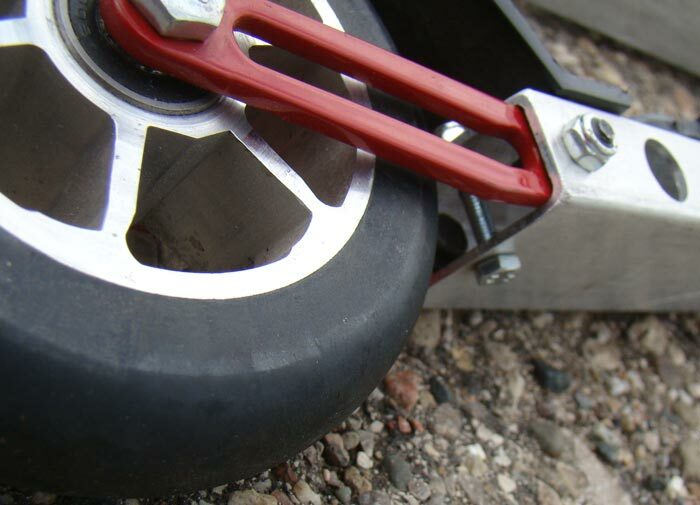 For the review, Clayton at RollerskiShop.com provided a 620 mm frame with 100 x 24mm medium wheels and NIS plates. The picture below provides a close-up of the flex-steel fork and how it attaches to the frame. A lock nut securely holds the fork. Notice the fork is not a single unit, but consists of a left fork and a right fork, each independently attached to the frame. Because there are no moving parts in the suspension frame design, you don't need to worry about replacing worn pivot joints or dampers. The Fork Flex rollerski was also quiet. The Rundle makes a little "thunk" and the Pro-Ski/Swix makes a bit of a "ping". With no pivot points or tension rods, the only sound the Fork Flex makes is normal wheels-on-pavement. The soft plastic fenders are very flexible so they bend instead of cracking. I've broken a number of hard plastic fenders from other vendors when the fender caught on something as I removed it or stored the rollerski in my car. Not going to happen with the Pursuit fender. The Pursuit fender is wider than most fenders and sticks out front and behind more, providing better protection from spray. They are noticeable better at keeping spray off my legs. Each fender comes with two mounting screws. Most other rollerskis only have one screen per fender, which have a tendency to loosen, letting the fender rotate to the side a bit, reducing protection unless you use LocTite or keep the screws tightened. They fit both 100 and 105 mm wheels. If you need a replacement fender for your non-Pursuit rollerskis, this is the one! And they are cheap! At the risk of looking silly to innocent bystanders, one of my tests consists of skiing with a new rollerski on one foot and a different rollerski on the other. When I compared my old tried and true Pro-Ski S3 skaters with the Fork Flex, I "tilted" - my S3 foot was significantly higher (58 mm) above the ground than my Fork Flex foot (50 mm). The first few skates felt a little weird! The swing weight is low - the ski felt shorter than it actually was, probably because the forks weigh so little. Low swing weight means it's easier to rotate the ski horizontally, such as picking up the ski and changing it's direction. It also means less fatigue for the skier. If you look at the second photo above, you'll notice that the frame sits below the wheel hub. On most other rollerskis, the axle is usually centered vertically in the frame. This lower center of gravity translates into a stable platform and a more ski-like feel. The Fork Flex Rollerski soaked up all the bumps at Kensington Metropark, including the infamous wooden bridge (photo above). I noticed that it did a better job the rougher it was or the bigger the bumps / cracks in the pavement. Although Kensington Metropark is a great place to ski for a variety of terrain, it doesn't have really rough pavement. For a real test of the suspension capabilities, I drove over to Maybury State Park next to Northville, Michigan. Maybury's bike path ranges from beautifully smooth, brand new pavement to alligator cracking, upheaval and swelling, minor pot holes, and severe raveling/weathering. 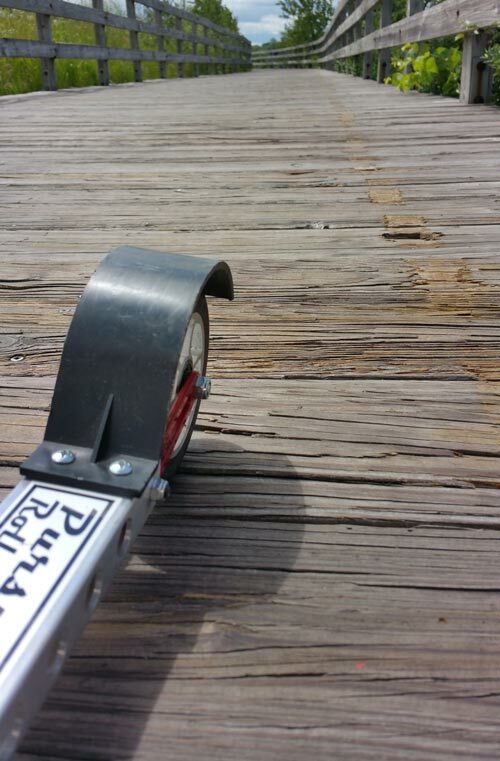 (See Asphalt Pavement Distress Summary or 10 Different Types of Failures of Flexible Pavement for nice sets of descriptive terms with which to wow your fellow rollerskiers). I'm happy to say the Fork Flex did a great job over all areas of Maybury. While I wouldn't say that I'd be comfortable skiing over some of the worse pavement over any distance with the Fork Flex, the suspension soaked up enough to make it skiable. 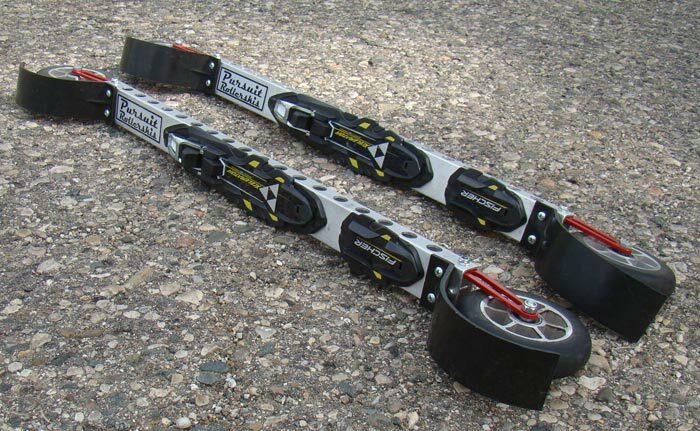 There's a loop I historically avoid on other rollerskis because of a quarter mile section that's buckled, swelled, cracked, and severely weathered, but I'd do that loop as part of my routine with the Fork Flex rollerski. The path at Kensington Metropark features a steep downhill with a fairly tight curve to the right at the bottom. I like to skate down the top of the hill to get some speed, then get into a tight tuck for the rest of hill and the curve at the bottom. The Pursuit Fork Flex was stable as I skated and stable in a tuck, staying in a straight line. I was somewhat surprised the rollerskis under-steered around the corner. That is, they didn't carve the line I thought they would, but took a slightly wider line. It was easily corrected, just unexpected. This only happened going very fast and around a tight corner - I did not experience it anywhere else. I did not get a chance to replicate the experience, since I was on a deadline that session, and haven't been out before again before I wrote this review. Maybe it was just do to my excellent climbing technique (NOT), but I thought the Pursuit Fork Flex rollerski climbed like champions! I'm admittedly not in the best rollerskiing shape this summer, spending most of my time on the bike preparing for a big ride in Death Valley in October, so I was pleased with the Fork Flex's performance on the uphills. The skis felt light under foot and rolled nicely uphill. I recommend the Pursuit Fork Flex skate rollerskis for anyone skiing on pavement, and particularly for skiers forced to ski on sections of rougher pavement. 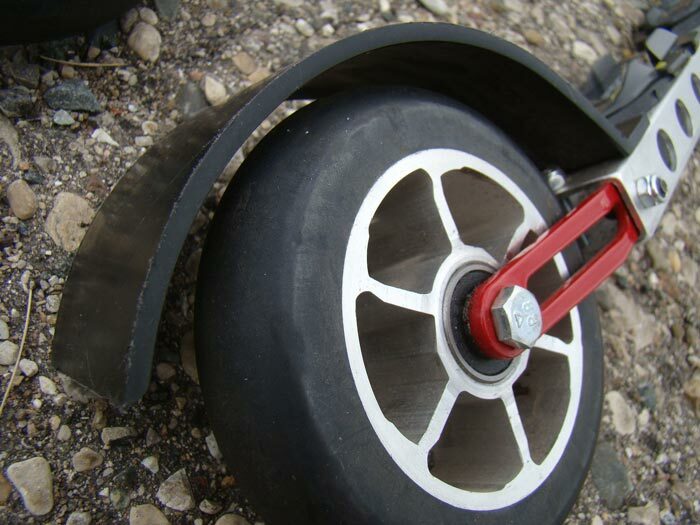 If you have miles and miles of very rough pavement you may still want to look an pneumatic-tired rollerskis since they will roll through anything, at the cost a extra weight and lower stability. For everyone else, the Pursuit Fork Flex is a great choice and is priced right. Marwe: Better watch your back!